OpenSolaris, ZFS, iSCSI and VMware are a great combination for provisioning Disaster Recovery (DR) systems at exceptionally low cost. There are some fundamentally well suited features of ZFS and VMFS volumes that provide a relatively simply and very efficient recovery process for VMware hosted non-zero RPO crash consistent recovery based environments. In this weblog I will demonstrate this capability and provide some step by step howto’s for replicating a ZFS, iSCSI and VMFS VMware based environment securely over a WAN or whatever you may have to a single ESXi remote server hosting a child OpenSolaris VM which provisions ZFS and iSCSI VMFS LUN’s to the parent ESXi host. The concept is to wrap the DR services into a single low cost self contained DR box that can be expanded out in the event of an actual DR incident while allowing for regular testing and validation processing without the high costs normally associated with standby DR systems. As one would expect this method becomes a very appealing solution for small to medium businesses who would normally abstain from DR provisioning activity due to the inherently high cost and complexity of DR. The following diagram illustrates this DR system architecture. When we have VMFS volumes backed by iSCSI based ZFS targets we gain the powerful replication capability of ZFS send and receive commands. This ZFS feature procures the ability to send an entire VMFS volume by way of a raw iSCSI target ZFS backing store. And once sent initially we can base all subsequent sends as a delta of change from a previous send snapshot which are respectively referred as snapshot deltas. Thus if we initially snapshot an iSCSI backing store and send the stream to a remote ZFS file system we can then send all the changed object data from that previous snapshot point to the current snapshot point and whatever else may be in between those snapshots. The result is a constant update of VMFS changes from the source ZFS file system to the remote ZFS file system of which can be completely different hardware. This ZFS hardware autonomy gift allows us to provision a much lower cost system on the DR remote side to host the VMFS volumes. For example the target system which is presented in this weblog is an IBM x3500 and the source is a SUN X4500 detailed in a previous blog. There are some important considerations that should be kept in mind when we use snapshots to create any DR process. One of the most important areas to consider is the data change rates on the VMFS volumes that are to be included in the DR send/receive process. When we have VMware servers or VM’s that have low memory allocations (a.k.a. over committed memory) or application behaviors that swap to disk frequently we will observe high volumes of what I call disk noise or disk data change that has no permanent value. High amounts of disk noise will consume more storage and bandwidth on both systems when snapshots are present. In cases where the disk noise reaches a rate of 1GB/Day or more per volume it would be prudent to isolate the noise sources on a VMFS volume that will not be part of the replication strategy. You could for example create a VMFS LUN for swap and temp files on the local ESX host which can be ignored in the replication scope. Another important area is the growth rate of the overall storage may require routine pruning of older snapshots to reduce the total consumption of disk. For example if we have high change rates from database sources which can not be isolated we can at monthly intervals destroy all but one of the last months snapshots to conserve the available storage on both systems. This method still provisions a good DR process and as well provides a level of continuous data protection (CDP) and is simmilar to a grandfather/father/son preservation scheme. Since we are handling valuable information we must use secure methods to access and handle the data transfers. This can be provisioned by using ssh and dedicated service accounts that will perform this one specific function. ZFS send and receive functions use an inherently secure approach by employing ssh as a transport tunnel when transmitting storage data to the target ZFS file system. This is just what we need to provision a secure exchange to a DR environment. Conversly we could use IPSec but this would be significantly more complex to achieve and complexity is not a good this when short implementation time is a priority.With this explanation wrapped up in our minds lets begin some of the detailed tasks that are required to procure this real world DR solution. The DR VMware server is based on the free ESXi product and with this we can encapsulate the entire DR functionallity in one server hardware platform. Within the ESXi engine we need to install and configure an OpenSolaris 5.11 snv_98 or higher VM using VMFS as the storage provider. This ESXi server configuration consists of a single SATA boot LUN and this LUN also stores the OpenSolaris iSCSI VM. In addition to the boot LUN we will create the ZFS iSCSI stores on serveral additional SATA disks that are presented to the OpenSolaris VM as separate VMFS datastores which we will use to create large vmdk’s. The virtual vmdk disks will be assigned as vdev’s for our receiving ZFS zpool. Talk about rampent layering. At this point we have a OpenSolaris VM defined on a hardware platform on which OpenSolaris would normally never work with natively in this example. You have goto love what you can do with VMware virtualization. By the way when SUN’s xVM product is more mature it could provision the same fuctionallity with native ZFS provisioning and that alone really is worth a talk, but lets continue our focus on this platform for now. There are many configuration options available on the network provisioning side of our ESXi host. In this case VLAN’s are definetly a solid choice for this application and is my prefered approach to controlling iSCSI data flow. We initially would only need to provide iSCSI access for the local OpenSolaris VM as this will provision a virtual SAN to the parent ESXi host. The parent ESXi host needs to be able mount the iSCSI target LUN’s that were available in the production environmant and validate that the DR process works. In the event of DR activation we would need to add external ESXi hosts and VLAN’s will provide both locally isolated iSCSI networks with easy expansion if these services are required externally all with out need to purchase external switch hardware for the system until it is required. Thus within the ESXi host we need to define a VLAN for the iSCSI SAN and an isolated VLAN for production VM validations and finally we need to define the replication and management network which can optionally use a VLAN or be untagged depending on your environment. This virtualized DR environment grants advanced capabilties to perform rich system tests at commodity prices. Very attracive indeed. For example you can now clone the replicated VMFS LUN’s on the DR engine and with a liitle Solaris SMF iSCSI target service magic provision the clone as a duplicated ESX environment which does not impact the ongoing replication. As well we have network isolation and virtualization that allows the environment to exist in a closed fully functional remotely accessible world. This world can also be extended out as a production mirror test environment with dynamic revert back in time and repeat functionallity. There are many possible ESXi network and disk configurations that would meet the DR server’s requirements. At the minimum we should provision the following elements. Provision a bootable single separate SATA disk with a minimum of 16G available for the VMFS LUN that will store the OpenSolaris iSCSI VM. Provision a minimum of three (optimally six) additional SATA disks or more if required as VMFS LUN’s to host the ZFS zpool vdev’s with vmdk’s. Provision a minimum of two 1Gb Ethernet adaptors, teamed would be preferable if more are available. 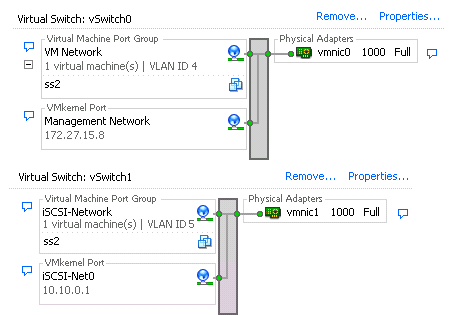 Define vSwitch0 with a VLAN tagged VM Network portgroup to connect the replication side of the OpenSolaris iSCSI VM and a Service Console portgroup to manage the ESXi host. Define vSwitch1 with a VLAN tagged iSCSI VM kernel portgroup to service the iSCSI data plane and also define a VM Network portgroup on the same VLAN to connect with the target interface of the OpenSolaris iSCSI VM. Define the required isolated VLAN tagged identically named portgroups as production on vSwitch0 and use a separated VLAN numbering set for them for isolation. Define the OpenSolaris VM with one adapter to connected to the production network portgroup and one adapter to attached to the iSCSI data plane portgroup to serve the iSCSI target IP. Here is an example of what the VM disk assignments should look like. Once the ESXi server is successfully built and the Opensolaris iSCSI VM is installed and functional we can create the required elements for enabling ZFS replication. On the systems that will act as replication partners create zfsadm ID’s as service accounts using the provided commands. Note the parameter -P ‘ZFS File System Management’, This will grant the account an RBAC profile association to administratively manage our ZFS file system unlike root which is much too powerful and is all to often used by many of us. The next step is to generate some crypto keys for ssh connectivity we start this with a login as the newly created zfsadm user and run a secure shell locally to ensure you have a .ssh directory and key files created in the home drive for the zfsadm user. Note this directory is normally hidden. The authenticity of host ‘localhost (127.0.0.1)’ can’t be established. RSA key fingerprint is 0c:aa:64:72:84:b5:04:1c:a2:d0:42:8e:9f:4e:09:9d. Warning: Permanently added ‘localhost’ (RSA) to the list of known hosts. Now that we have the .ssh directory we can create a crypto key pair and configure a relatively secure login without the need to enter a password for the remote host using this account. Do not enter a passphrase, it needs to be blank. Your identification has been saved in /export/home/zfsadm/.ssh/id_dsa. Your public key has been saved in /export/home/zfsadm/.ssh/id_dsa.pub. The id_dsa file should not be exposed outside of this directory as it contains the private key of the pair, only the public key file id_dsa.pub needs to be exported. Now that our key pair is generated we need to append the public portion of the key pair to a file named authorized_keys2. Repeat all the Create Service Accounts steps and crypto key steps on the remote server as well. We will use the Secure Copy command to place the public key file on each opposing hosts zfsadm users home directory so that when the ssh tunnel is started the remote host can decrypt the encrypted connection request completing the tunnel which is generated with the private part of the pair. This is why we must protect the private part of the pair from exposure. Granted we have also defined an additional layer of security here by defining a dedicated user for the ZFS send activity it is very important that the private key is secured properly and it is not necessary to back it up as you can regenerate them if required. This completes the trusted key secure login configuration and you should be able to secure shell from either system to the other without a password prompt using the zfsadm account. To further limit security exposure we could employe ipaddress restrictions and as well enable a firewall but this is beyond the scope of this blog. As a prerequisite you need to create the receiving zpool on the target to allow the zfs sends to occur. The receiving zpool name should be the same as the source to allow ease in the re-serving of iSCSI targets. Earlier we granted the “ZFS File System Management” profile to this zfsadm user. This RBAC profile allows us to run a pfexec command which pre checks what profiles the user is assigned and then executes appropriately based on this assignment. The bonus here is you do not have to create granular rights assignments to the ZFS file system. On the target server create your receiveing zpool. Using a cron job we will invoke our ZFS snapshots and send tasks to the target host with the execution of a bash script named zfs-daily.sh. We need to use the crontab command to create a job that will execute it as the zfsadm user, no other user except root can access this job and that a good thing considering it has the ability to shell to another host! As root add the zfs user name to the /etc/cron.d/cron.allow file. Here is the link for the zfs-daily.sh replication script you will need to grant exec rights to this file e.g. The replcation script needs to live in the zfsadm home directory /export/home/zfsadm at this point I only have the one script built but other ones are in the works like a grandfather/father/son snapshot rollup script. The first run of the script can take a considerable amount of time depending on the available bandwidth and size of the VMFS luns. This cron job runs at midnight and took 6 hours over 100MB’s of bandwidth the first time and less that 5 min thereafter. A secondary script that runs hourly and is rolled up at days end would be beneficial. I will get it around to that one and the grandfather/father/son script later. At this point we have an automated DR process that provides a form of CDP. But we do not have a way to access it so we need to perform some additional steps. In order for VMware to use the relocated VMFS iSCSI targets we need to reinstate some critical configuration info that was stored on the source Service Management Facility (SMF) repository. Within the iscsitgtd service properties we have the Network Address Authority (NAA) value which is named GUID in the properties list. This value is very important, when a VMFS is initialized the NAA is written to the VMFS volume header and this will need to be redefined on the DR target so that VMware will recognize the data store as available. If the NAA on the header and target do not match, the volume will not be visible to the DR VMware ESXi host. To protect this configuration info we need to export it from the source host and send it to the target host. The iscstgtd service configuration elements can be easily exported using the following command. Once exported to the backup directory we can Secure Copy this directory to the target system and this directory may also contain other useful info like installation instructions and so forth. This scp directory copy can be added to the zfs-daily.sh crontab script after it is performed once manually as it requires an interactive key signature trust authorization alternately it can be done manually after a configuration change occurs. I prefer the automated method so it is included in the script. To import the production service we would issue the following commands. Importing the iscsitgt service configuration is a simple task but it does have some elements that will be problematic if they are left unchecked. For example iSCSI Target Portal Group Tag values are included with the exported/inport function and thus you may need to change the portal groups values to correct discovery failure when the ip addresses are different on the target system. Another potential issue is leaving the existing SMF config in place and then importing the new one on top of it. This is not a best practice as you may create an invalid SMF for the iscsitgt service with elements that are orphaned out etc. The SMF properties will have the backing store path from the source server and if the target server does not have the same zpool name this will need to be fixed. And lastly make sure you have the same iscsitgtd version on each end since it will have potential changes between the versions. You will also need to add the ESXi software initiator to the iSCSI target(s) on the receiving server and grant access with an acl entry and chap info if used. To handle a TPGT configuration change its simply a matter of re-adding them with the iscsitadm utility as demonstrated here or possibly deleting the one that are not correct. To delete a tpgt that is not correct is very strait forward. Where 10.20.0.1 and 2 are the target interfaces that should participate in portal group 1 and ss1-zstore0 is the target alias. In some cases you may have to remove the tpgt all together. The backing store is editable as well as many other SMF properties. To change a backing store value in the SMF we use the svccfg command as follows. Changing the backing store value is instrumental if you wish to mount the VMFS LUN’s to provision system validation or online testing. However do not attach the file system from the active replicated zfs backing store to the ESXi server for validation or testing as it will fail any additional replications once it is modified outside of the active replication stream. You must first create a clone of a chosen snapshot and then modify the backing store to use this new backing store path. This method will present a read/write clone through the iscsitgt service and will have the same iqn names so no reconfiguration would be required to create different time windows into the data stores or reversion to a previous point. Here is an example of how this would be accomplished. To change to a different snapshot time you would simply need to destroy or rename the current clone and replace it with a new or renamed clone of an existing snapshot on the same clone backing store path. The ESXi iSCSI software configuration is quite strait forward. In this architecture we need to place an interface of the OpenSolaris iSCSI target host on vSwitch1 which is where we defined the iSCSI-Net0 VM kernel network. To do this we create a VM Network portgroup on the same VLAN ID as the iSCSI VM kernel interface. Here is an example of what this configuration looks like. For more deatail on how to configure the iSCSI VM interfaces see this blog http://blog.laspina.ca/ubiquitous/running_zfs_over_iscsi_as in this case you would not need to define an aggregate since there is only one interface for the iSCSI vSAN. The final step in the configuration is to define a discovery target on the iSCSI software configuration panel and then rescan the vmhba for new devices. Hopefully this blog was of interest for you. November 7th, 2008 | Tags: clone, disaster, howto, iscsi, recovery, replication, snapshot, vmfs, VMware, zfs.